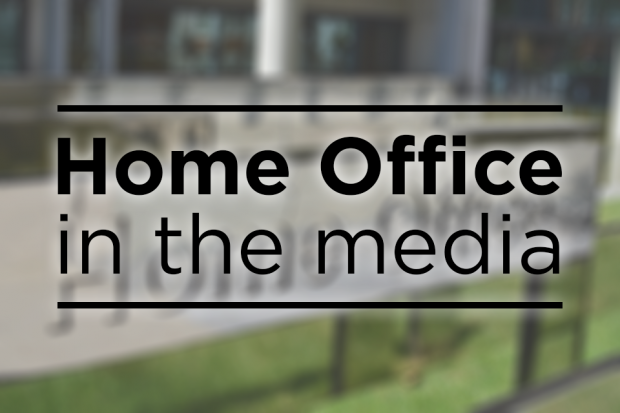 Today’s Home Office stories include the Migration Advisory Committee report on EEA migration and post-Brexit policing. Most of the papers carry prominent coverage on yesterday’s report from the Migration Advisory Committee on the impact of migration from the EU. The report advises the Government to make it easier for high-skilled workers to come to the UK. The MAC said there should be no preference for EU citizens beyond the Brexit implementation period and that the Government should lift the cap on Tier 2 visas. The Guardian splashed on the story, stating that business leaders are lining up to criticise the MAC after it proposed an '"ignorant and elitist" ban on foreign workers earning less than £30,000 a year obtaining visas to work in the UK after Brexit'. The Independent raises concern that a proposed scheme for 5,000 non-EU workers to come to the UK on six-month visas to work on British farms over the next two years “could create a hotbed for modern slavery”. The MAC report described the Seasonal Agricultural Workers scheme, announced earlier this month, as offering “considerable control” to employers. The Times and the Telegraph argue that the report will give a boost to the Prime Minister’s plans for a tough new immigration regime. The Home Office response to the MAC report can be found below. “After we leave the EU, we will take back control of our borders and put in place an immigration system that works in the interests of the whole of the UK. "We commissioned this report in addition to our engagement with business to better understand the impact of EU citizens on the UK labour market. The Government is clear that EU citizens play an important and positive role in our economy and society and we want that to continue after we leave. There is coverage across the papers including the Guardian, Times, Independent, Mail, Sun and Express of what a no-deal Brexit could mean for policing. The Guardian, Independent and Mirror report on comments made by the Chair of the National Police Chiefs' Council, Sara Thornton who said on Tuesday that a no-deal Brexit will make it harder for police to protect citizens because they will be forced to use “slower more bureaucratic systems”. The papers report that UK law enforcement would lose access to almost 40 powers, including the European Arrest Warrant, without which they would be forced to look to 1957 extradition legislation, which does not cover all countries. The Times, Telegraph and Mail also report that a no-deal could hit the Salisbury police inquiry as police could lose essential crime-fighting tools. The Express reports that police chiefs have been accused of Project Fear tactics by claiming Britain will be less safe after a no-deal Brexit. The claims were challenged by former Scotland Yard detective, Mick Neville as "simply scaremongering" and "a policing version of Project Fear". The Home Office response to this story can be found below. "We do not want or expect a no deal scenario and are confident that we will secure a deal with the EU. “The Government has been clear that we need to continue and enhance internal security cooperation with the EU after Brexit. This is in the interests of not only the UK but also EU member states and their citizens and that is why we are seeking a new comprehensive agreement, which includes data sharing and extradition arrangements.